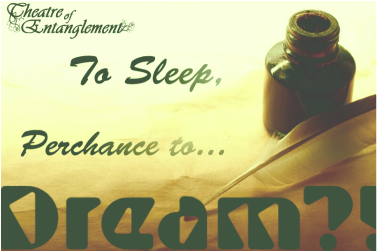 To Sleep, Perchance To Dream is a farcical take on Shakespeare's writing process. It introduces the fun and accessible side of Shakespeare's work through taking out of context lines from some of his most famous plays; Macbeth, Romeo&Juliet, The Tempest, A Midsummer Night's Dream and Twelfth Night. William is struggling with writer's block. It's not that he can't think of anything ("Wherefore art thou, Mike? "), it's just that he can never just concentrate, what with his wife nagging him about taking out the rubbish. engagement, and where he gets into some serious trouble when he is forced to aid a Scottish fugitive with a knife, who says he killed the king! Will Will find a way to wake up from this mad dream?